I think he’s confused. He may be a local person – he lived and worked in Dunedin for a long time – but his role is not “local MP” as this implies that he was elected to represent the Dunedin region. As a list MP he was elected to represent the National Party, they chose him and they gave him a high enough position on the list so that if there were enough Party votes (which there were) he would become a Member of Parliament. The farthest this could be stretched is “he was elected to represent the National Party which was elected to represent the whole of NZ”. I am surprised that he doesn’t “get” the difference. DCC campaign flyer delivered to households end of last week. Sorry I was too slow to see it! Blimey, you’re a goer. Facebook went ‘gulp’. But hey! This rebuild has been in the field for a few years now, yet the bureaucrats are still dithering over details, nothing to do with the obvious as detailed so eminently by Prof David Jones, a man entirely devoted to the merits of the hospital and its relationship to the Otago University’s Medical School and its learning facilities. The difference is that bureaucrats and politicians have this inexhaustible ability to lose the plot. Just look at the abysmal performance of Steven Joyce in his handling of the Invermay Research Facility at Mosgiel, a fully supported adjunct of the Otago University. The appalling decision of the Mayor and council to give a right to ACC over the Frederick St Carpark site. Sooner or later we will get a new hospital, like as not it will be in Lawrence or Kaitangita. No sense will be seen but the decision will be made, not by medical people, but bureaucrats and politicians, without a vested interest in Dunedin’s welfare at all. Why would any government listen to a local administration with the appalling record of the DCC? I would say that any actions recommended by the DCC would be like a poison pen letter to any government whether National or Labour. I agree with the considered opinions of Crs Vandervis, Lord and Hall. Cr Vandervis responded in a statement by email last week, saying he would not attend any part of the [SOS] campaign because it was “ill-considered”. I think these councillors on both sides need to get over themselves. So what if your political leanings are Labour/Green or National? They seem to forget they are politicians with their own agendas. It makes no sense to me why you would want to beach a new hospital on a more distant Greenfield site. Totally impractical for our Med School… as long as it survives down here. But maybe that is the Government’s plan to kill it off. A Greenfield site away from the university should help. No one (loudly) appears to want a non central city site, however playing power games between the *discrepancy* that is local and central government can come at terrible cost. A citizen group of any persuasion to do the SOS would have been better than have DCC head it. Worrying. True. But that is Dunedin. Let someone else do the hard yakka. It is always left to more politicised people. In this case, politicians. Most people prefer to silently complain about decisions made on their behalf. Disaffection from the political process may explain some of this. There is not one politician or political grouping down here that acts as a lightning rod. I’ll say it loudly. Wakari appears to me to make more sense from a community health delivery point of view – More effective bang for a fixed (inadequate?) budget, less disruption and a couple of other plusses. The impact of a move to Wakari on fringe activity/speculation profit delivery stemming from existing investment positions taken related to the development of the Centre City site? Well who knows, but methinks that particular calculation might look a bit different for some. “Wakari appears to me to make more sense from a community health delivery point of view” – no no and NO. Wakari is a bugger to get to without private transport, expensive to get to by 2 or more buses, so that’s unfair for poor people and non-drivers attending clinics and visiting people in hospital. Unless Medical School were to be relocated up there too the inconvenience and waste of time associated would be MASSIVE. University of Otago health sciences foster multidisciplinary work with other departments and research groups on campus – there is no cogent reason or efficiency I can think of to destabilise existing and potential collaborations and deliveries by shifting the tertiary level hospital away from the university hub or indeed the central business district and available visitor accommodation stetching into North Dunedin. If these aspects aren’t broke don’t fix it. Staging of the hospital build and refurbishment is possible in the existing and near location. Out of interest – this is not a criticism of the spend per se. My official information request was made yesterday. You asked a series of questions re the costs of the hospital campaign to which I provide answers below. I have also included additional information provided to Councillors for completeness. 1. When did Council decide to print a flyer? Following the Council resolving to “ask other organisations, agencies and individuals who support this view to also convey it to Government” a flyer was determined to be the best mechanism on or around the 10th of March 2017. 2. How many flyers were printed? 3. How many copies were distributed to Dunedin households? 4. Who delivered the flyers? 5. What was the cost of producing/printing the flyer? 6. What was the cost for distribution? 7. How many flyers remain on hand? The costs for the production and distribution have been met by the Council’s Communication and Marketing Department budget. Graphic design, website and social media work was all provided by staff. Therefore, the costs are $7102 (excl GST). I trust this answers your enquiry. Sent: Wednesday, 29 March 2017 2:26 p.m.
2. Were they required to quote? They did provide a quote and on the basis of that quote, were engaged to produce the video. Hype, were it to be moved I would assume that even our local authorities would not overlook revising the bus routes, and a better (covered/accessible/safe) bus station and taxi rank could be provided to boot on site. Ditto patient and visitor carparks. You surely have had the experience of waiting (patiently) while a patient totters across one of the uneven and generally lethal high-speed pedestrian road crossings around the present hospital. This advantage also applies to the Med School, were they to move up there too. I would presume they currently have the same horrible carparking issues for staff and students that the rest of the Uni does, as well as a lack of space for expansion. At present if I have visitors coming to see me at work I have to book a (scarce) work park days in advance. Otherwise there’s nothing to be had, free, paid or otherwise, within a kilometre of my office. Once the cycle lanes go in on the one-ways, then that situation is going to get a whole lot worse around my workplace – and even worse yet around the hospital. 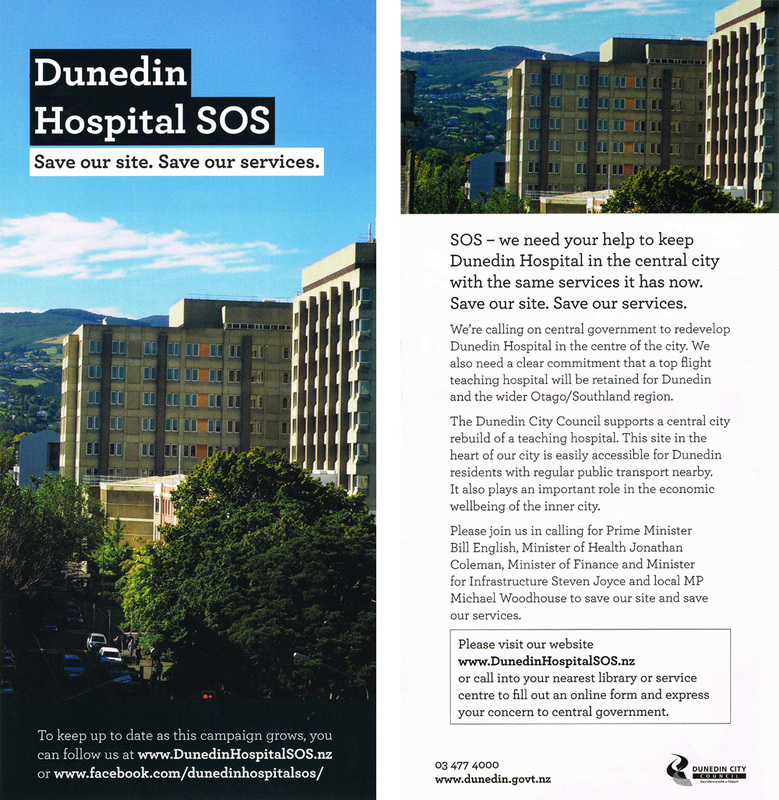 Heart of Dunedin Inc has written to Prime Minister Bill English supporting the council’s Dunedin Hospital SOS campaign. Michael Woodhouse has been interviewed on Channel 39 News tonight – about the hospital site. If the video comes available, will link. A public campaign to keep Dunedin Hospital in the central city with the same services is being launched today.